The lady is seen here is this unicorn tapestry tasting candy from a plate held by her handmaiden. 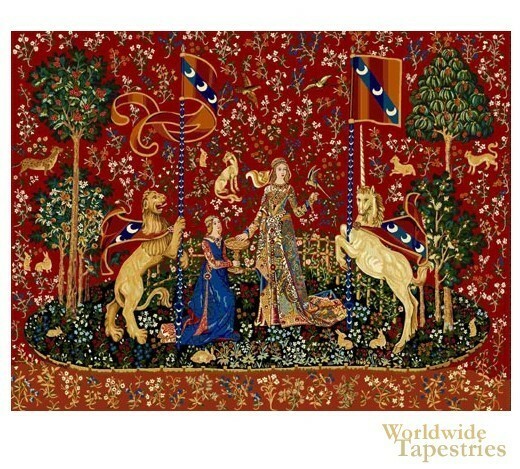 The Lady and the Unicorn series of tapestries originated from medieval France, and is now in the Musee national du Moyen Age, formerly known as the Musee de Cluny in Paris. They were found in the Boussac castle in 1841 after centuries of storage and brought forward for the world to see. This piece shows the sense of taste in a background used in traditional French tapestry production known as the mille-fleur background of flora and fauna. This unicorn tapestry Taste (Le Gout) I is backed with lining and tunnel for easy hanging. Dimensions: W 34" x H 24"
Dimensions: W 68" x H 50"